Are you looking to buy a ceramic knife to add to your collection but are not quite sure which one to pick? Ceramic knives offer many advantages over steel ones but are not suited for every task. But don’t despair! In this detailed review, we will tell you all you need to know to choose the ceramic knife that best suits your needs. What kind of food can you use them with? Can I pair them up with any cutting board? Can I sharpen my ceramic knife? Continue reading and let us show you 5 of the best models available today. Why should you buy a ceramic knife? Why shouldn’t you buy a ceramic knife? How to care and store ceramic knives? How long do ceramic knives last? Can ceramic knives go in the dishwasher? Can metal detectors detect ceramic knives? Are ceramic knives better than steel knives? Are you in a hurry? With more than 900 satisfied customer reviews, you can’t go wrong with this popular Cuisinart set. 12 Pieces Set: 6 knives and 6 blade guards. Includes: Chef Knife, Slicing Knife, Serrated Bread Knife, Santoku Knife, Utility Knife and Paring Knife. High quality durable stainless steel blade with ceramic coating. Nonstick surface, perfect for slicing. Suitable for cutting and slicing delicate soft food: vegetables, fruits, soft bread, boneless meats. Complete set, suitable for most food prep task at a very competitive price. The blade is not pure ceramic, but stainless steel with a ceramic coating. This means that the blade won’t be as sharp or hard as a zirconia ceramic blade, but at the same time, it will be less brittle. Not suitable for carving, prying or cutting hard foods: meat with bones, frozen foods, hard skin fruits, etc. Slightly heavier than pure ceramic knives. The blade of a ceramic knife is usually made of zirconia (zirconium dioxide). If you need more technical information about this material and the production of ceramic knives, I suggest you read the dedicated Wikipedia entry, but let’s get to business. What benefits do you get buy buying a knife with a blade of ceramic instead of a metal one? The ceramic blade will stay sharper up to 10 times longer than a steel blade. The blade is harder than a metal one. More resistant to acids and bacteria accumulation. Don’t contaminate food. Food won’t stick on them so easily. Even if the blade is harder, is not as tough as metal, so these knives are prone to cracks or chipping if mishandled or dropped. Black blades will usually be harder than white ones because they endured a process called isostatic pressing, which gives the material more strength. Ceramic knives with colored blades are not usually made of pure ceramic (powdered zirconia) but are instead made of stainless steel with a ceramic coating. Are ceramic knives and ceramic coating knives the same? Which one should you choose? The blade stays sharper longer. Food won’t stick on it so easily. More resistant to acids and bacteria accumulation. With the added benefit that the blade won’t break so easily if the knife is mishandled or dropped and they are also usually dishwater safe (not all ceramic blades are suitable for the dishwasher). 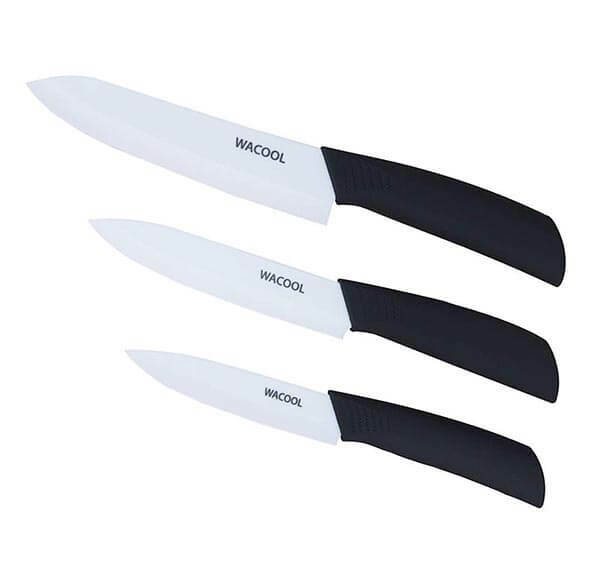 If you are looking for greater durability and you are sure you will care for your knife set, we may suggest to try pure ceramic knives sets like the WACOOL 3 pieces sets. 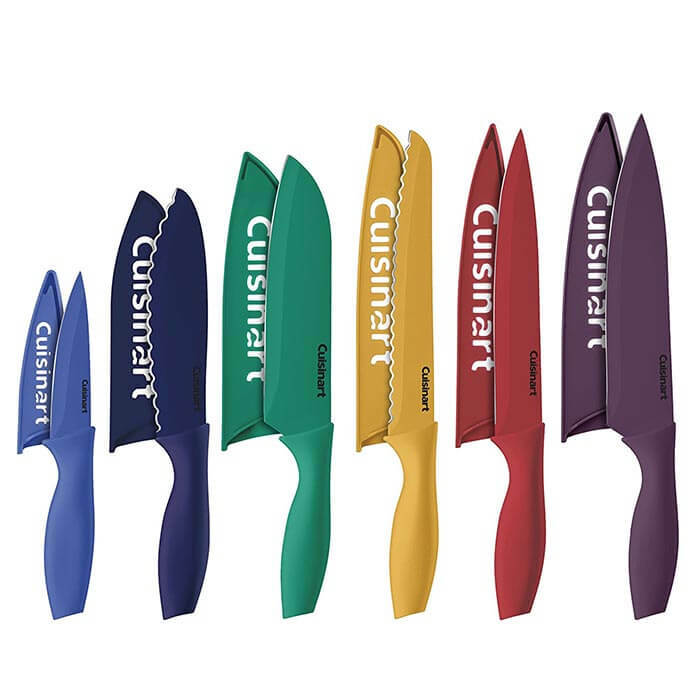 If you are worried that your knife may deteriorate easily but still want to get most benefits that ceramic knives offer, then you can’t go wrong with the popular Cuisinart C55-12PCKSAM 12 Piece Color Set. When we talk about the best brands that offer essential kitchen utensils, it’s impossible to not find at least a Cuisinart product between them. 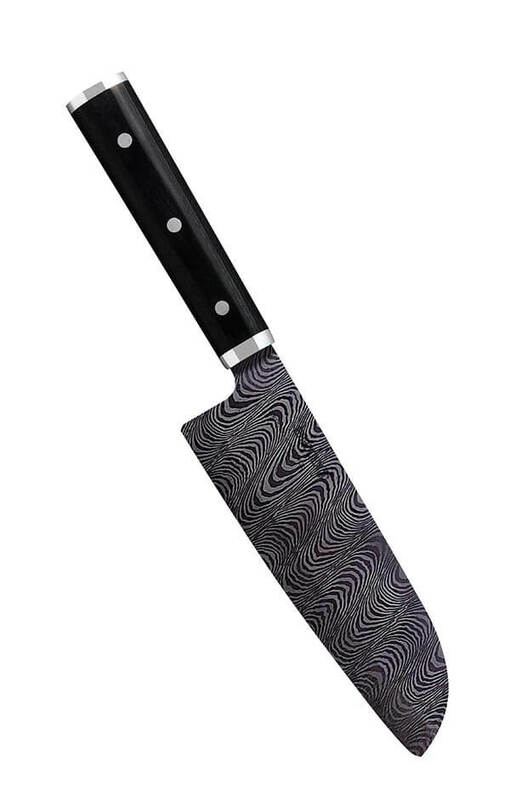 This model is one of the most popular in the ceramic knives category, but beware that the blades are made of stainless steel coated in ceramic, not powdered zirconia. If you are not really sure what model to buy even after reading the information we provide in this guide and have no particular needs, then we suggest you stick to the most popular product and try this complete set, available at a very competitive price. 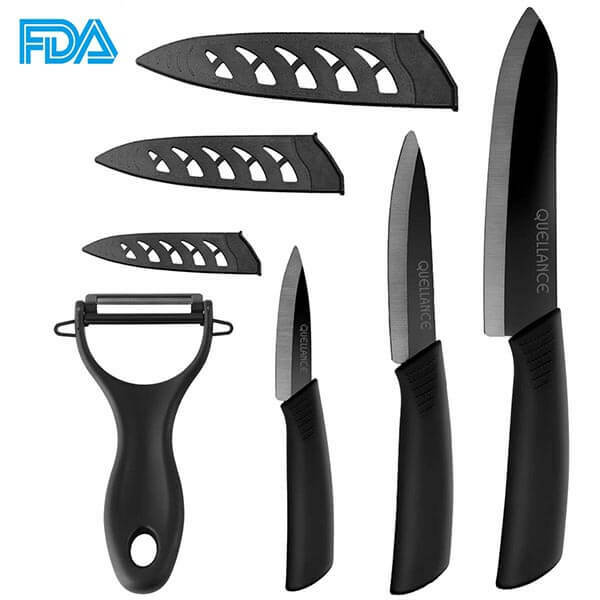 Would you like to try your first ceramic knife set without investing too much money? Then this popular WACOOL 3 pieces set is the second best choice for you. 3 Sheaths, one for each blade. If you are willing to spend a little more without overdoing it, this set provides excellent quality at a very fair price. The set also includes a ceramic vegetable and fruit peeler. Finally, the elegant package makes the QUELLANCE Ceramic Knife set an ideal choice for a gift. This one-knife only option cost pretty much the same as an entire QUELLANCE 3 pieces set, but don’t let the price draws you back. 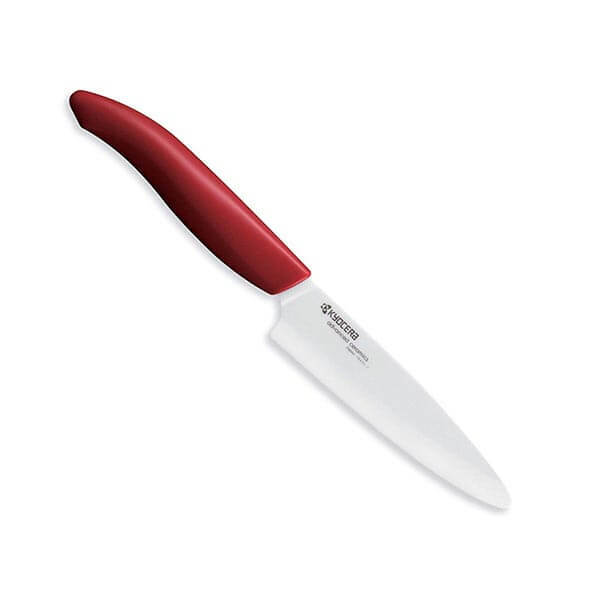 Kyocera is a high-quality ceramic knife crafted with a proprietary zirconia material produced in Japan. With this little gem, you’ll be able to handle the most basic task in the kitchen that involves soft food. You can slice vegetables, fruits, and boneless fish and meats. Not all ceramic knives are suitable for dishwasher, but Kyocera is dishwater safe, provided you place it in the top rack, separated from other utensils. If money is not a problem and you are looking for a high-quality ceramic knife at a great price, we suggest you try it. If you are a professional, looking for excellent quality gear but don’t want to invest more than $400 on a, let’s say, Nesmuk knife, then the Kyocera KTN-180-HIP is a very suitable choice. See that little HIP acronym in the name? When we talked about choosing a ceramic knife, we said that black blades are tougher than white ones. HIP is basically the name of the process that strengthens the blade. In conclusion, this blade is one of the toughest and durable you can find in a ceramic knife. It is worth the price? You better believe it. Some professional handcrafted chef knives can go as high as $2.500 per piece. Top quality kitchen accessories don’t certainly come cheap, and professional chefs feel the difference right away. If it is the first time you will buy a ceramic knife and you are not entirely sure if it will be of use to you, then we suggest you stick to cheaper options. If the investment is not an issue, however, you are looking at an extremely lightweight, superb knife that can last you well over 10 years, and that only the most high-quality steel knives can top in sharpness. Kyocera offers an affordable sharpening service, so this little gem will keep you company up to ten times longer than your average cutlery. Remember, if you choose this model you are not only buying a knife, but a little piece of art, crafted with great care inspired by many Japanese cultural elements. If you can’t take care of it, better stick to other models. Ceramic knives are much harder than metal ones, but the blade is not as tough or flexible. That means that the blade sharpness will last longer, provided you don’t drop it or mishandle it. Wash by hand with hot water and detergent after every use. Some sets are dishwater safe (we suggest you read the manufacturer instructions), provided you use the top rack and don’t mix them with other utensils. Don’t throw them in a drawer mixed with other utensils. Ceramic blades should be handled with great care as to avoid cracking them. Try to always buy a set that provides covers. If you don’t have covers, a wooden knife block is preferable over other materials. Don’t use them to cut hard foods (meats with bone, frozen foods, hard bread and cheese, hard skin fruits, etc.). Ceramic blades are sharper than metal ones, but only intended for slicing, not carving or prying. Use only wood or plastic cutting boards to slice food. Avoid glass or marble, as the surface may damage your knife blade. Wood is always preferable over plastic, as the latter accumulate more bacteria. You may want to check our buyer’s guide about maple cutting boards. Quality ceramic blades can last up to 10 times longer than metal ones. You won’t need to sharpen them as often, but you may want to know if it’s possible to do it. Truth is, being the material much harder, you won’t be able to sharpen ceramic blades by traditional means or with the same accessories that you would use with a metal blade. Fortunately enough, you can buy all you need to do it yourself at a reasonable price. Just be sure that you are buying a knife sharpener suitable for ceramic knives. A study shows that ceramic blades last up to 10 times longer than a normal steel blade. The mohs scale of mineral hardness is a very old method for roughly comparing the hardness of different materials. 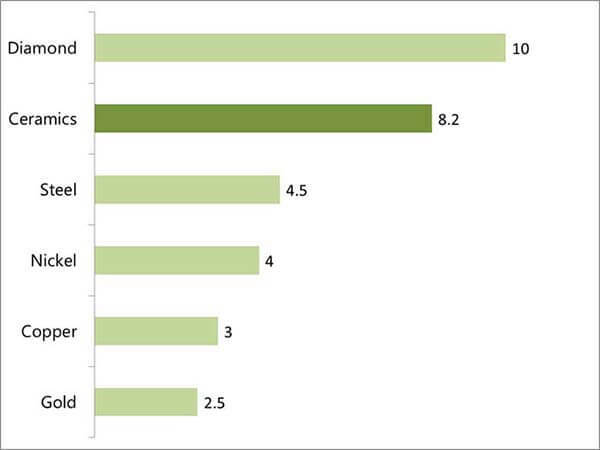 The following graph shows how ceramics fare against steel on the mohs scale. Not all models. Ceramic blades should be treated with great care and you should always follow the instructions of the manufacturer. Some of them are marked as dishwater safe, as long as you use the top rack and don’t mix them with other metal utensils. 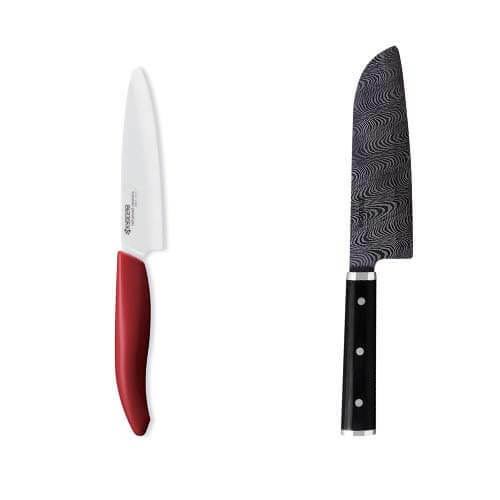 In our buyer’s guide, both the Kyocera Advanced Ceramic Revolution Utility Knife and the Cuisinart C55-12PCKSAM 12 Piece are dishwater safe. Let me tell you right away that it is not a good idea to carry any kind of blunt weapon on your pockets or carry-on luggage. If you are wondering if someone would be able to smuggle ceramic knives on a plane undetected, the answer is, it depends. Most knives will contain metal to some degree, if not in the blade it may be in the handle or the screws. If the knife does not contain metals parts, it will probably be detected by non-metal scanners, x-ray or human controls. Ceramic knives cannot completely replace a reliable multi-purpose professional steel chef knife. It’s a good idea to include ceramic knives on your arsenal, as their blade is harder, sharper, and will last longer, but it’s not suitable to handle hard foods (bones, hard skins, hard bread, etc.). Resistant to acids and bacteria. The surface prevents food from sticking on the blade.